Showing results for tags 'filled'. June 22nd is deemed National Eclair Day. I grew up eating home-madeeclairs, and I sure miss them now that I am gluten-free. This is not atricky recipe to pull off, but it is time consuming. However, if you can pull it off, you willnot regret the time you spent trying. French Style Custard Filled Eclairs (Gluten-Free) Ingredients - Dough for eclairs 1/2 cup milk 1/2 cup water 1 stick butter - cut into 8 pieces 1 teaspoon sugar 1/8 teaspoon salt 1 cup gluten-free flour 1/2 teaspoon xanthan gum 3 large eggs Ingredients - Vanilla Custard Filling 1 cup milk 1 cup half & half Large (moist) vanilla bean scraped, or teaspoon vanilla 5 egg yolks 1/3 cup sugar 1/4 cup cornstarch 2 tablespoons butter cut into pieces Ingredients - Chocolate Glaze 1 cup cream 8-9 oz. Gluten-free semisweet or bittersweet chocolate chips 1 tablespoon butter 1 teaspoon light corn syrup (or agave) Directions – For the Dough In a good size saucepan heat the milk, water, sugar, salt and butter. Bring to a light boil. While that heats up, mix the flour with the xanthan gum. As soon as it boils add the flour all at once and stir with a wooden spoon like crazy, and keep stirring until the dough comes together and is shiny. The bottom of the pan will develop a crust, but keep stirring over low heat for about a minute more. Dump the ball of dough into a large bowl or stand mixer. Let it sit for no more than 5 minutes to cool slightly. Add the eggs while mixing on medium speed one at a time, incorporating the egg fully before adding another one. The dough will look like it is falling apart but by the time you finish it will look fine. Keep mixing for about another 30 seconds after the last egg is added until the dough comes together. It will look shiny and sticky, but won't form a ball. If you can pipe, use a 1/2 inch tip and pipe the dough onto parchment or silpat covered baking sheets into little logs for eclairs. Depending on how big you want to make them, you can get anywhere from 4 of each to 6 of each. Immediately place in a 375 degree oven and leave it until they are nice and brown. That should take about 25 minutes, but check after 15 minutes. Remove them from the oven and slice a little slit into each one to let the steam escape and place it back in the oven which is now turned off, but still warm. Leave them in there for another 30 minutes to continue drying. Remove and let the eclairs cool. Once cool, use a serrated knife and slice the tops off so that they can be filled. Remove the inner dough until you have a nice little cavity to fill with pastry cream. Leave them out to dry a little bit while you prepare the pastry cream. Directions - Pastry Cream Heat up the milk and half & half until warm and add the vanilla and the beans. Turn the heat off and cover. Leave it for about 15 minutes to infuse the milk with vanilla. Prepare two bowls, one slightly bigger than the other. In the larger one add some ice and set the smaller bowl on the ice. It should be large enough to hold the pastry cream mixture. Add to that bowl, a mesh strainer which you will use to push the cream through to eliminate any lumps. In the meantime, mix the sugar and cornstarch together and add the egg yolks and mix with a whisk until smooth. Add some of the hot vanilla milk to the sugar/egg mixture to temper the eggs and warm them up. Then add that to the warm vanilla milk and turn the heat up to medium. Keep whisking the mixture until it comes to a boil. Simmer at a low boil for a minute or two and remove from the heat. Immediately turn the pastry cream into the mesh strainer and stir and push it through into the bowl that is sitting on the ice. Once all the pastry cream is in the bowl, stir to cool the mixture a bit. Remove the bowl from the ice and add the butter and whisk to incorporate as it melts. Then return the bowl to the ice and let it sit for about 15 minutes, stirring often until the pastry cream is chilled. 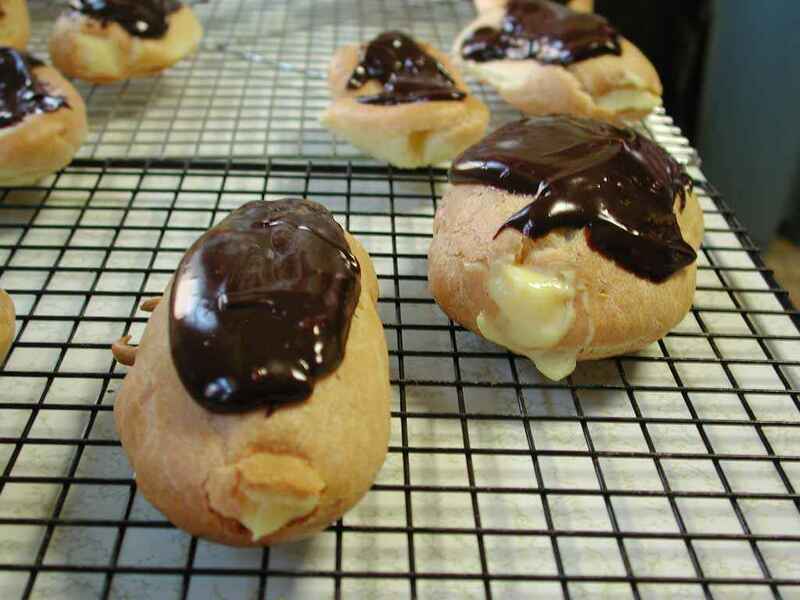 Using a small spoon, fill each eclair as much as you like and place the top back on. Line them up on a wire rack on the baking sheet for the chocolate topping. Directions - Chocolate Topping Place the chocolate in a bowl and heat the cream in a small saucepan until it simmers to a low boil. Pour that over the chocolate and leave it alone for a minute. Then begin stirring until the cream and chocolate are totally smooth. Add the butter and the light corn syrup and stir until incorporated. Let the mixture sit for a minute or two until still warm but not hot. Using a spoon pour chocolate over each pastry. Let them set for a few minutes. Refrigerate. Leave out for a short time before serving for best flavor. They taste even better the second day. Bon Appetit! Kay's Naturals makes snacking healthy, and they have done it yet again. The leader of high-protein, gluten-free snacks has come out with another delicious product. 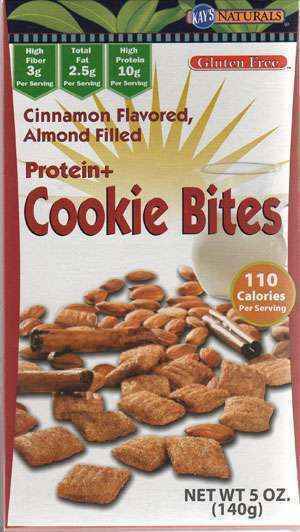 Cinnamon flavored, almond butter-filled Cookie Bites by Kay's Naturals, is a scrumptious bite sized cookie snack that tastes good right out of the box, or poured in a bowl with your favorite milk. Kay's Cinnamon Cookie Bites are light, flaky and crunchy all rolled into one full-flavored bite. The almond flavor is subtle and not over-powering, and each bite is coated with just the right amount of cinnamon, so it stay's flavorful (and crunchy) in milk. Not only are Kay's all natural Cookie Bites tasty, they're healthy too. Kay's Cookie Bites are made with all natural ingredients; no GMO ingredients are used to make Kay's products. Each serving comes with ten grams of protein (the protein equivalent of two eggs), three grams of fiber, and zero cholesterol. So if you are looking to build muscles, lose weight, or simply munch on something yummy and healthy, then these snacks are for you. Kay's Cookie Bites come in one ounce or five ounce bags, making them ideal for keeping a large box in your pantry, and popping some single serve bags into your purse or backpack for an on-the-go snack. Kay's snacks are low in sugar, only three grams per serving, and as a bonus, they are also low glycemic ( for those watching their sugar intake), making these high-protein snacks a great addition to your child's lunch box, or as an after-school snack. Kay's batch tests all of their products for gluten-free, so you can enjoy your snacks worry-free. For more information on ordering this and other Kay's Naturals products, visit their site: http://kaysnaturals.com/celiac/ Note: Articles that appearin the "Gluten-Free Product Reviews" section of this site are paid advertisements. For more information about this seeour Advertising Page.